As part of the railway upgrade from Ferny Grove to Keperra over 2010-2012, Queensland Rail is committed to reducing its impact on the environment and is working with our local bushcare organisations and groups to enhance the habitat at various areas in Bob Cassimaty Park Picnic Grounds. Queensland Rail completed and signed an agreement with Brisbane City Council and Kedron Brook Catchment Branch-Wildlife Queensland in September, 2011, and continues to strongly support the project . See a map of Bob Cassimaty Park, showing the layout of the four stages of planting in relation to Samford Road, Kedron Brook and the junction with Cedar Creek. Note that the sketch map may show incorrect dates, eg stage 3 is to be held on 21 April. Refer to 'Future planting program' below. 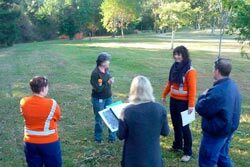 Kedron Brook Catchment Branch, alongside Brisbane City Council (Habitat Brisbane & Creek Ranger Field Services), put forward a four stage plan to plant over 3 300 native plants and trees in Bob Cassimaty Park Picnic Grounds. This will help to replace various native trees and vegetation lost in severe storms over the past two years in the vicinity and reduce the overall impact of the railway station and car park upgrade. 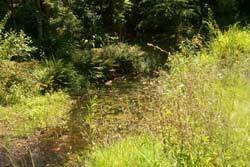 Men of the Trees (MOTT) has worked for many years to re-establish bushland areas around Ferny Grove (See their web site ). They enthusiastically agreed to come on board to assist with the plantings, which will continue over a two year period including ongoing maintenance. Other community assistance has come from the Wahminda Grove Bushcare Group and individual volunteers from around Ferny Grove. The first stage of plantings was carried out successfully on Saturday morning, 15 October, 2011. A heavy storm, from the previous night, cleared in time for the early setup for the planting next day. Participants from QR, BCC, MOTT, KBCB, Wahminda Grove Bushcare Group and local community volunteers combined well and were well-satisfied that the targets for planting were achieved. A representative from Queensland Rail spoke with participants and welcomed the vigorous beginning to the project. State Member for Ferny Grove and Minister for Health, Geoff Wilson MP, also visited the activity. He talked enthusiastically both to individual volunteers and more formally to the group expressing his thanks for the successful start of another important project in which government bodies worked closely together with the community. 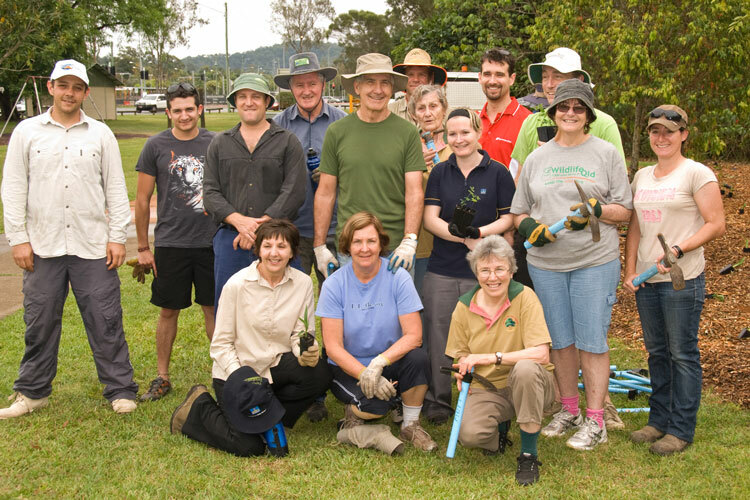 Part of the total group of volunteers that assisted at the planting of section 1 of the first stage of the Queensland Railway Habitat Rejuvenation Project held at Bob Cassimaty Park Picnic Grounds on Saturday,15 October 2011. A planting in Stage 1, section 2, as an extension to the first planting area, was to be carried out on 10 December 2011. Unfortunately, rainy conditions on that day caused this planting to be postponed to Saturday 21 January. 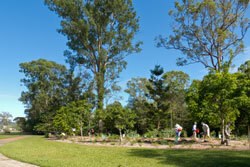 The relatively large Stage 1 area of plantings at Bob Cassimaty Park, Ferny Grove, was completed on Saturday 21 January under warm to hot sunny conditions. By starting early (setup from 6 am! ), we were able to complete the bulk of the work before the heat of the day that rose about 10.30 am or so. We could then cleanup around the plants, enjoy drinks and sausage sizzle and look back at our work. There was a good representation from local groups, e.g. 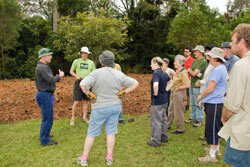 Wahminda Grove and Ferny Grove Bushcare Groups, an especially large representation from MOTT, volunteers of staff from Queensland Rail, members of KBCB and KBCN and community volunteers. Local member for Ferny Grove, Geoff Wilson MLA, State Minister for Health, commended those present for the valuable service they were doing for the community. The vital plant maintenance schedule is being carried out in parallel; bimonthly through to January 2013. Kedron Brook can be rather pretty behind Bob Cassimaty Park but not when weeds are so prolific. This Stage 2 plot was revegetated on Saturday 3 March. The final mass planting to cover remaining areas requiring additional planting was carried out on Saturday morning, 23 June, 2012. A representative group of the participating organisations (QR, MOTT, KBCB, KBCN) carried out the plantings with some general revegetation work to restore and protect this important corridor for the wildlife. All finished in good time to celebrate the completion of work at Bob Cassimaty Picnic Grounds with late morning tea and a sausage sizzle. State Member for Ferny Grove, Dale Shuttleworth took the opportunity to join the event early in the morning and planted a significant number of plants. He later teamed up with MOTT Secretary, Louise Cadel, to help with the cooking and serving of the BBQ sizzles to the volunteers and other workers. KBCB President Robert Standish-White and State Member Dale Shuttleworth, thanked all of the volunteers and especially Queensland Rail for their support with this project. Acting Creek Ranger, Jacinta Hamilton, echoed this thanks, including BCC staff and also those families that enabled the volunteers and other workers to give so much of their time. A 'Planting and Maintenance' get together is being organised by MOTT on Saturday 2 November and Saturday 7 December, both 9 am till 12.30 pm at the Bob Cassimaty Picnic Grounds. For further information on this type of activity, watch our web site and that of MOTT. For MOTT arrangements, contact Fran on 3851 0858.